January 09, 2018—Salt Lake City—SwipeClock LLC today announced it has acquired Shugo, a leader in providing innovative SaaS-based workforce products and services for small- and medium-sized businesses. The acquisition enables SwipeClock to broaden its workforce management offerings and provide channel partners and their clients with additional solutions that make managing workforces easier and more cost effective. Shugo is a natural fit with SwipeClock’s goal to expand the number of innovative workforce management solutions it offers to small- and medium-sized businesses beyond scheduling and timekeeping. Shugo’s product line includes an intuitive and customizable employee portal with punch clock, access to payroll information, company communications and alerts, a company directory, and options for HR tasks and workflow processes. The combined product offerings will enable SwipeClock to offer an even more powerful and intuitive employee and manager portal that already has wide adoption across both companies’ customer bases. Shugo has focused on integrating its solutions with payroll software products and building a distribution channel using payroll service bureaus, both important facets of SwipeClock’s growth objectives. Finally, Shugo’s expertise in unifying user interfaces and providing an innovative set of products and services that employers and employees want to use is key for SwipeClock to become a more complete workforce management solution provider. SwipeClock is a leader in simple and affordable workforce management solutions. More than 1,000 payroll and HR service providers partner with SwipeClock, empowering 35,000+ businesses and their 1,000,000+ employees to reduce labor costs, comply with regulations, and maximize profits. 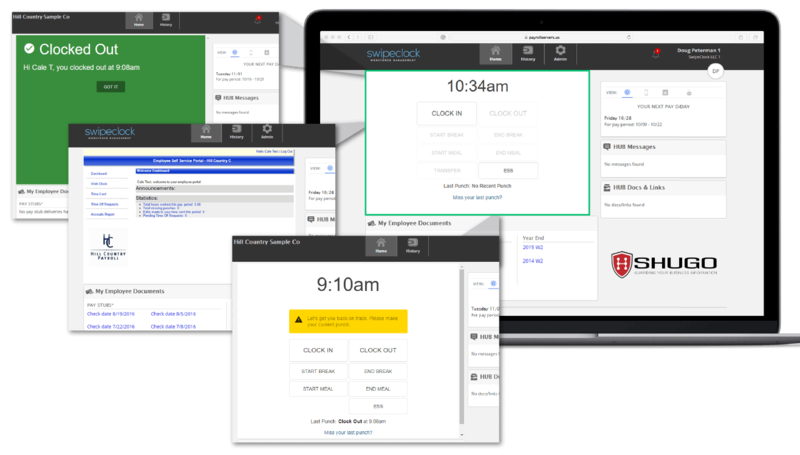 SwipeClock solutions streamline HR management, from applicant tracking to timekeeping, advanced scheduling, benefits enrollment, secure online document storage, employee engagement and automated workflows. These solutions are integrated and mobile-ready. SwipeClock products include WorkforceHUB, TimeWorksPlus, TimeSimplicity, ApplicantStack, and intelligent hardware clocks TimeWorksTouch and TimeWorksTUFF for rugged timekeeping in the field. SwipeClock and its partners help employers transform labor from a cost of doing business to a competitive advantage.